The 10th Ladies World Roller Hockey Championship opened today in Alcobendas, near Madrid Spain. All the participating counties attended a spectacular opening ceremony accompanied by an award winning group of artistic skaters. After the opening ceremony the host nation took on Japan in the first match of the championships which will be played to the old rules, each day will have eight matches for the remainder of the tournament. But as the CIRH has an assembly no matches will be played on the Wednesday. Tickets for the Under 17′s European championships are now available, domestic sales can be purchase from Michaela Parfitt and International sales are available online. Tickets are priced at £50 for a weekly family ticket which admits 2 Adults and up to 3 under 17 children and £20 for a weekly single ticket. Daily tickets are currently available at £5 for Monday and Saturday and £3 for the Tuesday, Wednesday, Thursday and Friday. Sales are expected to brisk for finals day on the Saturday so be sure to buy your tickets sooner rather then later. This years England under 17 team “Project 2010” entered the National Premier League to gain experience playing together in preparation for the 2010 Under 17 European Championship at the Benham Sports Arena, Northampton starting on August bank holiday Monday. The selection have won four matches over the season earning a respectable twelve points and scoring over sixty four goals against the top senior teams in the UK. The final team will be picked by Carlos Amaral NRHA’s National Performance Director on the run up to the championships. 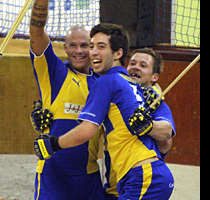 SEE THE PICTURES of their match Herne Bay v Project 2010 on 12th June at the pier in Herne Bay. Congratulations to Herne Bay United for winning the 2010 Premier League after a spectacular head to head match with Middlesbrough last Saturday. The game was end to end with each team matching each others goals all the way through to the last few minutes. As one of the one hundred spectators said “it could go either way”. For the spectators it was great roller hockey. If I were to say Monjos beat Areces 5-4 on the 8th May in Spain you may well ask what is that to do with us in the UK. I can tell you that both of these Spanish National Div1 teams have English players playing for them and have done so for years. Andrew Ashurst (Monjos) and Ian Morrison (Areces) have been friends for many years and this is the first season their clubs have competed in the same league. Areces were at home for this match and Ian Morrison their first goalkeeper has been playing for the team based near Oviedo for four years out of his ten years he has been playing Spain. Ian want out to Spain to join the Division of Honour club Vic (equivalent to the premier league) and in 2001 won a CERS Cup medal. Since then Ian has played for several Spanish clubs and has now settled in Northern Spain with his Spanish girl friend. 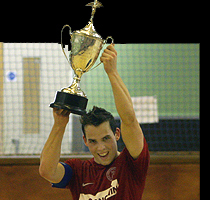 Andrew Ashurst went out to Spain with his parents twenty years ago at the age of twelve to play Roller Hockey and of course finishing his education and hasn’t looked back since. Andrew is now married with a little girl and the couple are expecting a new addition to the family in October. Andrew and his mum are successful proprietors of an English school which is based south of Barcelona. Andrew had an injury for this match and didn’t play but he still travelled in one of the team cars for seven hours for the match. Roller Hockey in Spain at the top levels mean long distances to travel and for the bigger clubs this could be a flight to play their game. 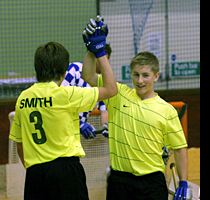 At the beginning of September 2010 the European 2010 Male under 17 Roller Hockey Championships will be held here in the UK and the NRHA made a decision back in the later part of last year to host this prestigious event in Northampton. 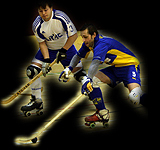 The 2010 Euro Championships is planned to take place at the Benham Sports Arena Kings Park Road, Northampton from 30th August – 4th September. Englands National Performance Director Carlos Amaral is currently putting our young hopefuls through selection and is hoping to stage some demonstration matches at Benham in the summer. The Under 17 Euro Championships is the first International debutees will compete in Roller Hockey with many going on to represent their countries in years to come. The championships official website www.euro2010nrha.co.uk is now online and as part of raising the awareness of the tournament, a promotional video is available to see via the championship website. Preparations are also underway to raise the sponsorship needed to host these championships and if any of our members are aware of any potential backers it would be good to hear from you. 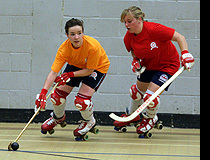 RHC Invicta had a victorious debut at the pier on Saturday in the 1st round of the 2010 National Knockout Cup. The newly formed club thrilled the 100 strong crowd with an end to end match pushing their mature and more experienced rivals Herne Bay in to defeat after producing a cracking “Golden Goal”. See the well executed move.